Cutaneous malignancies, especially malignant melanoma, exhibit great genetic heterogeneity. As a result, some individuals and families have particularly increased risk due to genetic predisposition to the disease. The susceptibility alleles range from rarely occurring, heritable, high-risk variants to ubiquitously occurring low-risk variants. Although until now the focus has been mostly towards the familial high-risk genes, the development of genome-wide association studies has uncovered a number of moderate- to low-risk predisposition alleles. The ability to specifically identify genetic variation associated with visible pigmentation traits and disease risk has provided a much richer view of the genetics of cutaneous malignancies. In this review, we provide an update on the recently identified risk loci. Existing clinical data, combined with vast genome information, will provide a better understanding of the biology of disease, and increased accuracy in risk prediction. Cutaneous malignancies such as highly invasive melanoma, and the keratinocyte carcinomas, such as basal cell carcinoma (BCC) and squamous cell carcinoma (SCC), have become increasingly common in recent decades. According to the Surveillance, Epidemiology and End Results (SEER) program, it is estimated that 74,610 men and women will be diagnosed with skin cancer in 2009 in the United States, and mortality is estimated to be 11,590 (excluding BCC and SCC) . For melanoma alone, the diagnosis is estimated to be 68,720, and 8,650 . BCC is the most common type of skin cancer and accounts for 80% of all skin cancers. Nearly half of people with BCC have recurrent tumors within five years of development of the primary tumor. Like most cancers, the risk factors for cutaneous malignancies include both genetic and environmental components. The notion that melanoma has a genetic predisposition was first put forth in 1820 by William Norris, who claimed it has 'a strong tendency to hereditary predisposition' . Later studies reported correlation between the prevalence of familial multiple melanomas and the occurrence of 'atypical nevi (moles)', and they were described as familial atypical multiple-mole melanoma (FAMMM) syndrome or BK mole syndrome [4, 5]. Advances in linkage analysis in the late 1980s to early 1990s directed much attention towards identifying high-risk, high-penetrance loci associated with familial predisposition to melanoma. Several groups identified germline mutations of the p16INK4a (now cyclin-dependent kinase inhibitor 2A, CDKN2A) gene on chromosome 9p21, and established the molecular basis of hereditary melanoma in a subset of melanoma-prone kindreds (highlighted in ). Subsequently, Zuo and colleagues  identified heritable alterations in the CDK4 gene in a few families that lacked germline CDKN2A mutations. The mutation rates of high-risk heritable alleles are less prevalent, although the biological relevance of these mutations is well characterized (reviewed in [8–10]). A study in three continents including a large population demonstrated that mutations in CDKN2A loci account for disease susceptibility in 20 to 57% of all melanoma families . A comprehensive meta-analysis by Gandini and colleagues  revealed a direct link between pigmentation and melanoma risk. There are more than 120 genes involved in regulating pigmentation status, among which melanocortin-1-receptor (MC1R) is a key regulator. Many variants of this gene sequence are implicated in melanoma risk (reviewed in [14, 15]). 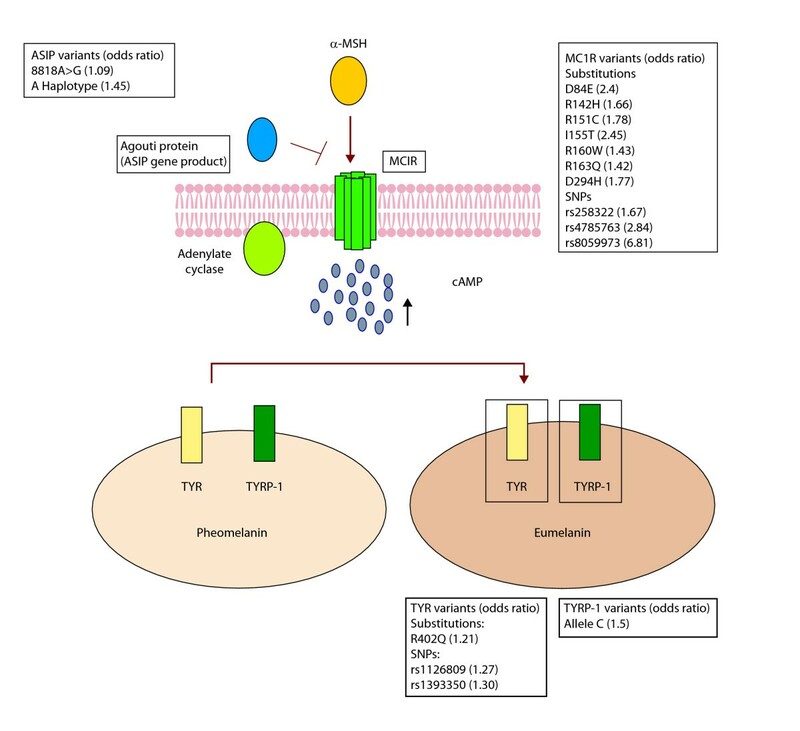 MC1R triggers a cAMP-dependent intracellular response that leads to the production of dark eumelanin in preference over red pheomelanin (Figure 1); eumelanin is thought to provide greater protection against ultraviolet radiation (UVR) than pheomelanin [16, 17]. The presence of germline MC1R variants correlates with skin/hair color and poor tanning ability (80% in individuals with red hair color (RHC) and/or fair skin, 20% in individuals with brown or black hair, and less than 4% in people with good tanning response) and increases CM risk by 3.9-fold . Raimondi and colleagues  reviewed all MC1R variants and classified them based on RHC phenotype: (a) four 'R' MC1R variants (p.Asp84Glu, p.Arg151Cys, p.Arg160Trp, and p.Asp294His) strongly associated with the RHC phenotype; (b) two less frequent 'R' alleles (p. Arg142His and p.Ile155Thr) based on strong familial association with RHC phenotype; and (c) three 'r' alleles (p.Val60Leu, p.Val92Met, and p.Arg163Gln) with weaker association with the RHC phenotype. Except for p. Val60Leu and p.Val92Met, all other variants appear significantly associated with melanoma risk, with odds ratios (ORs) with a 95% confidence interval (CI) ranging from 1.42 (1.09 to 1.85) for p.Arg163Gln to 2.45 (1.32 to 4.55) for p.Ile155Thr. Two studies estimated the penetrance of MC1R variants to be approximately 84% [20, 21]. There is also some early evidence that MC1R status is associated with BRAF mutagenesis, suggesting a predisposition to develop BRAF-driven tumors in individuals carrying these variants [22, 23]. An illustration of the MC1R pigmentation pathway and the loci implicated in melanoma risk. The binding of melanocortin-stimulating hormone (α-MSH) to its transmembrane receptor, Melanocortin-1-receptor (MC1R), results in stimulation of adenylate cyclase (AC) to produce cAMP. An antagonist to α-MSH, called Agouti protein (encoded by ASIP loci), inhibits this interaction. The release of cAMP in the cytoplasm activates the melanosomal enzymes, including tyrosinase (TYR) and tyrosinase-related protein-1 (TYRP-1), on the cell membrane of the melanosomes, resulting in a shift of pigment synthesis from pheomelanin to eumelanin. The variants of the genes encoding these proteins are listed. The corresponding odds ratio represents the risk of developing melanoma in patients carrying these variants. Another GWAS identified variants associated with hair and eye pigmentation, skin sensitivity to sun and freckling among 2,986 Icelanders . Shortly thereafter, the same group discovered another two coding variants in TPCN2 (two-pore segment channel 2) that were associated with hair color, and a variant at the ASIP locus (which encodes the Agouti protein) that showed strong association with sun sensitivity, freckling, and red hair - phenotypic features similar to those in individuals carrying variants in MC1R . In 2008, a much larger study examined 11 SNPs from eight pigmentation-associated loci (SLC24A4 (solute carrier family 24), KITLG (KIT ligand), 6p25.3, TYR (tyrosinase), OCA2 (oculocutaneous albinism II), TPCN2 (two-pore segment channel 2), ASIP (Agouti signal protein), TYRP1 (tyrosinase-related protein 1)) for CM and BCC risk. Three cohorts (810 individuals with CM and 36,723 non-CM controls from Iceland; 1,033 CM cases and 2,650 controls from Sweden and 278 CM cases and 1,297 controls from Spain) were tested for melanoma risk effects. A two-SNP haplotype was identified at the ASIP locus that showed strong association with CM (combined OR = 1.45; P = 1.2 × 10-9), while an additional non-synonymous coding variant in TYR (combined OR = 1.21; P = 2.8 × 10-7) and a non-coding SNP at the TYRP1 locus were also associated significantly with melanoma risk (rs1408799; combined for all three samples, OR = 1.15; P = 0.00043) . A second independent GWAS based in Australia also found evidence of a melanoma risk locus at the ASIP locus on chromosome 20q11 . A recent GWAS based on population samples collected across European populations living at different latitudes has uncovered additional melanoma risk loci with suggestive biological consequences , although these are yet to be validated. The result was a joint effort from ten GenoMEL groups with 1,650 cases and 1,065 controls. The team identified five loci on chromosomes 2, 5, 9, 11 and 16, with at least one SNP at each locus with genome-wide significance (P < 5 × 10-7). Three of these loci were replicated in an independent cohort of 1,163 cases and 903 controls. The strongest association was seen in chromosome 16q, with one new SNP (rs8059973, OR = 0.74), which was different from two other previously reported SNPs on the same locus with association to hair color and skin pigmentation (rs258322, rs4785763) . The rs8258322 SNP (OR (95% CI) = 1.16 × 10-12 to 2.54 × 10-27) was comparable to the MC1R variant previously described  in terms of increased cutaneous melanoma risk, though the location of the SNP is distant from the MC1R locus per se. In addition, a chromosome 11 SNP near the TYR gene showed evidence of association with melanoma (rs1393350; P = 2.41 × 10-4). A third region on chromosome 9p21 also showed significant association with melanoma. The implicated SNP (rs7023329, P = 4.03 × 10-7) is near, but distinct from, the high-risk CDKN2A locus; it appears to be more physically aligned with the methylthioadenosine phosphorylase (MTAP) gene that flanks the CDKN2A region. These novel loci will be a key addition to the pigmentation variants of TYR previously identified by deCODE genetics . The GWAS analyses also uncovered some risk variants whose genetic interactions are more complex. Interestingly, in the large Icelandic-based GWAS, MC1R variants conferred little or no increased risk of CM among the Icelandic population, whereas significant risks for CM were observed in both the Swedish and Spanish cohorts . These findings suggest that RHC variants are not the only genetic risk factors for melanoma in the Icelandic cohort. This is consistent with an earlier study showing that some MC1R variants conferred melanoma risk but were not associated with hair and skin color phenotypes . Table 1 summarizes the known relationships between various GWAS loci and their associated pigmentary and cancer phenotypes. BCC, basal cell carcinoma; CM, cutaneous melanoma; NRHC, non-red hair color variants; RHC, red hair color variants. BCC is the most common cancer and is sporadic in nature, although inherited forms have been described in the case of nevoid basal cell carcinoma syndrome (NBCCS). This is characterized by rapid development of numerous BCCs in young patients, with a median age of 20 years [30, 31]. Susceptibility to BCC has been shown to be strongly associated with variants on chromosomes 1p36, 1q42, and 5p15 . Notably, some of the sequence variants responsible for BCC appear to be independent of pigmentation traits; in fact, the 5p15 variant at the TERT-CLPTM1L (telomerase reverse transcriptase-cleft lip and palate transmembrane 1-like) locus is protective against melanoma. The deCODE group also identified three SNPs associated with non-melanoma skin cancer but not melanoma or pigmentation: (a) rs11170164 in the keratin 5 (KRT5) gene with a G138E substitution (combined OR 1.35, P = 2.1 × 10-9) conferring susceptibility to BCC; (b) rs2151280 on chromosome 9p21 near the CDKN2A/B locus; and (c) rs157935 on chromosome 7q32 . Melanocytic nevi (or 'moles') represent both precursors and markers of melanoma risk [33, 34]. The genetics of melanocytic nevus formation appear to be related to, but distinct from, CM development. A meta-analysis of 46 different studies related to nevus formation and melanoma risk showed that a high mole count (101 to 120) increased the relative risk (RR) of melanoma by about seven-fold (RR = 6.89; 95% CI) when compared to a low nevus count (0 to 15). In a parallel estimate, the RR was over six times higher between the presence of five atypical moles and no moles at all (RR = 6.52; 95% CI) . These studies clearly highlight that an increase in nevus count may indicate a genetic predisposition to melanoma but that environmental factors such as UV exposure and the deregulation of genes at particular signaling pathways could potentiate this effect. Subsequent studies have linked a high nevus count to the two melanoma loci on chromosome 9 including the CDKN2A region [35, 36]. Recently, a large GWAS was conducted on mole count using 297,108 SNPs in a cohort of 1,524 twins from the TwinsUK registry, with subsequent validation in an independent European cohort. The strongest association was reported for a SNP in the MTAP locus next to CDKN2A on chromosome 9p21 (rs4636294, combined P = 3.4 × 10-15). Another SNP on 22q13.1 (rs132985, OR = 1.23) also showed a strong replicated signal (P = 2.6 × 10-7) . It is intriguing to note that 9p21 loci also harbor SNPs that have been implicated in both susceptibility to BCC and association to pigmentation phenotypes as described above [12, 28]. The associated SNP on chromosome 9p21, rs 7023329, which was reported in the Bishop et al. study , has also been reported in this study. Furthermore, the 9p21 locus also harbors strong-risk SNPs for cardiac disease and type II diabetes. The biological relationship between these SNPs and different disorders remains a source of intense investigation. Large-scale GWASs have identified a large number of moderate- to low-risk melanoma variants in different cohorts over the past few years. The information gained from these studies advances melanoma risk prediction more than ever. Although interesting in its own right, the GWAS results are unlikely to impact clinical management at the current time. Lower-risk alleles compete against other behavioral risk factors that may modulate one's overall likelihood of developing melanoma and other forms of skin cancer. It is also somewhat ironic that high-power genetic approaches have recovered strong allelic signals in pathways that dictate pigmentation - a phenotype well known for decades to confer cancer risk. The recent harvest of GWAS analyses provides a fundamental element for risk prediction but further research is needed. Commercial interest in utilizing GWAS results should be viewed with some trepidation, as it may lead to a false sense of security, or anxiety. However, the promise of this new information is a clearer explanation of gene-gene and gene-environment interactions that will undoubtedly emerge over the next decade. The authors would like to thank all the colleagues around the world whose scientific contributions formed the basis of this article. DU and HT wrote the manuscript. Both authors approved the final version of the manuscript.